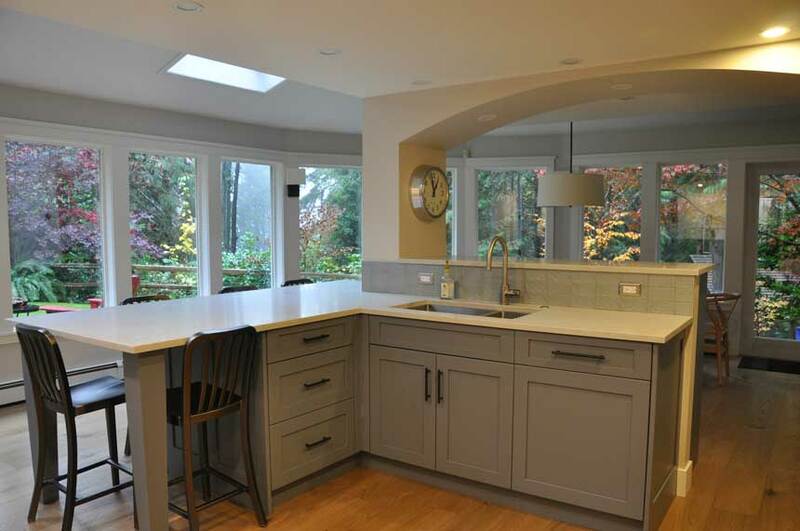 This North Vancouver kitchen renovation’s main goal was to brighten the space and make it more modern. We refaced the kitchen cabinets with new doors and millwork details. New white oak floors were installed on the entire main floor of the home, making it feel more open and bright. 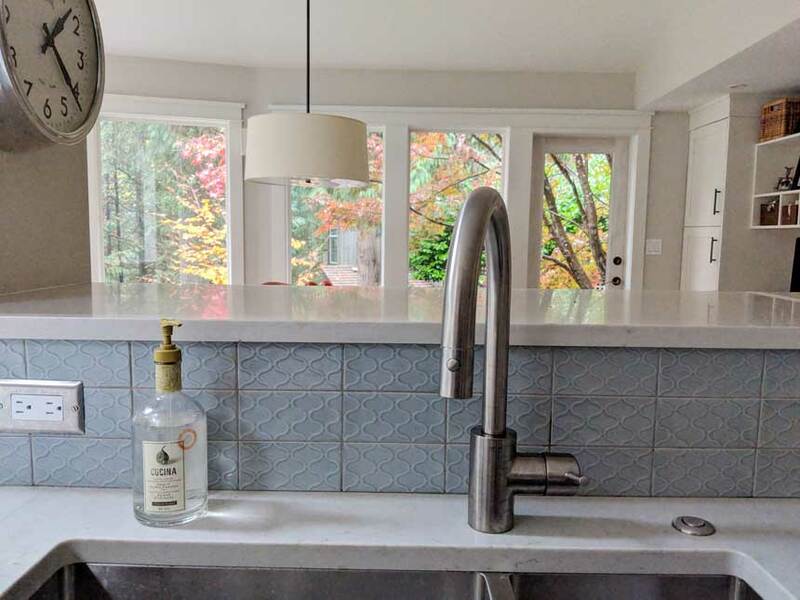 Paint colour was a big consideration in this kitchen because it’s surrounded by windows that reflect green light from outside because of all the trees. We went with Benjamin Moore Balboa Mist to brighten up the room while still keeping it warm and inviting. Here’s a before photo (shown below) to give you an idea of how much of a transformation this kitchen went through. 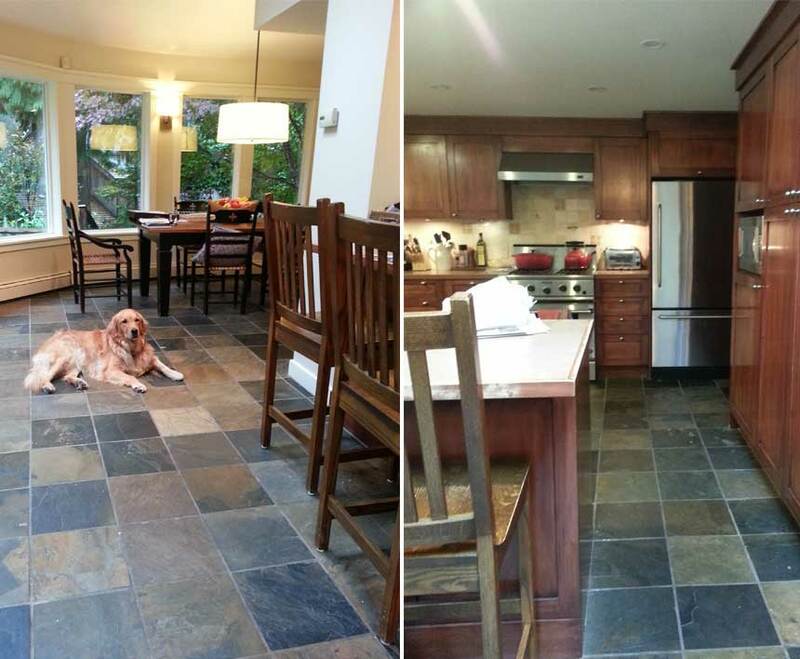 Goodbye dated slate tile floors and dark wood cabinets. 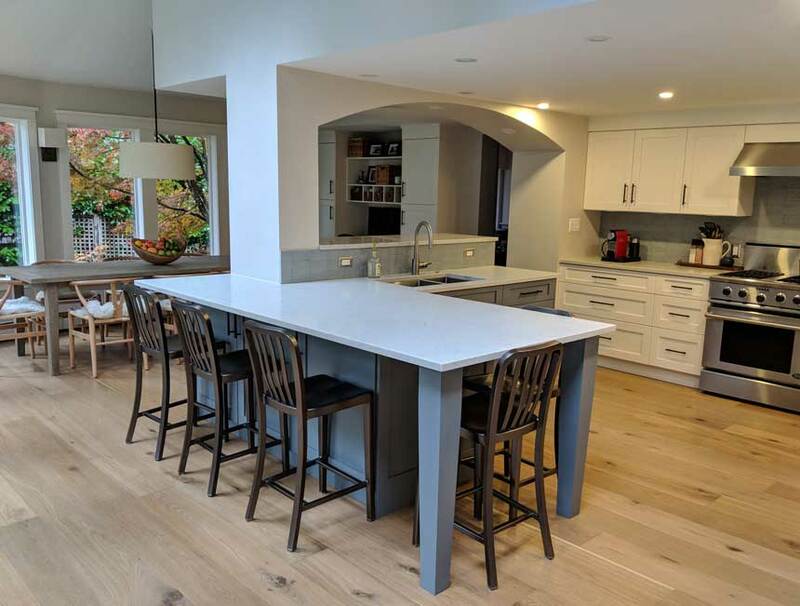 As you can see, it really helps to install a consistent flooring material to clean up the kitchen and dining area and then you can accent with some colours within the kitchen. 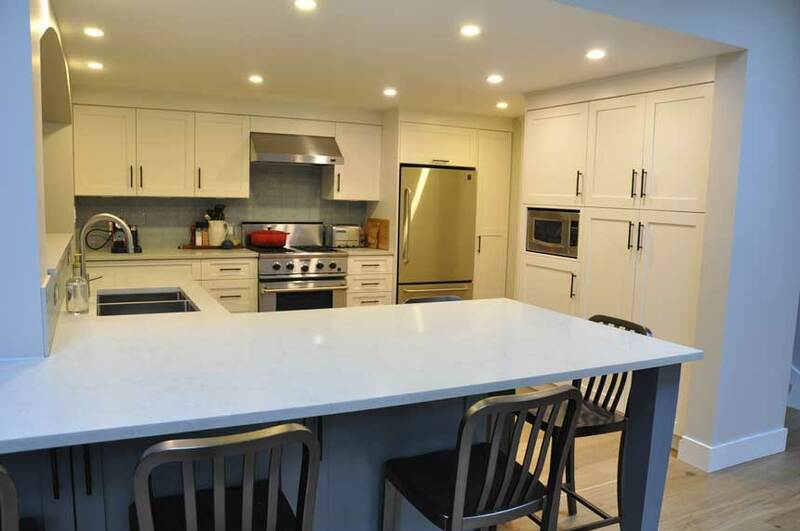 In this case, we used a combination of white cabinets with a blue/grey cabinet door. Then the backsplash was a light blue with a subtle pattern to add personality, along with dark metal cabinet pulls. 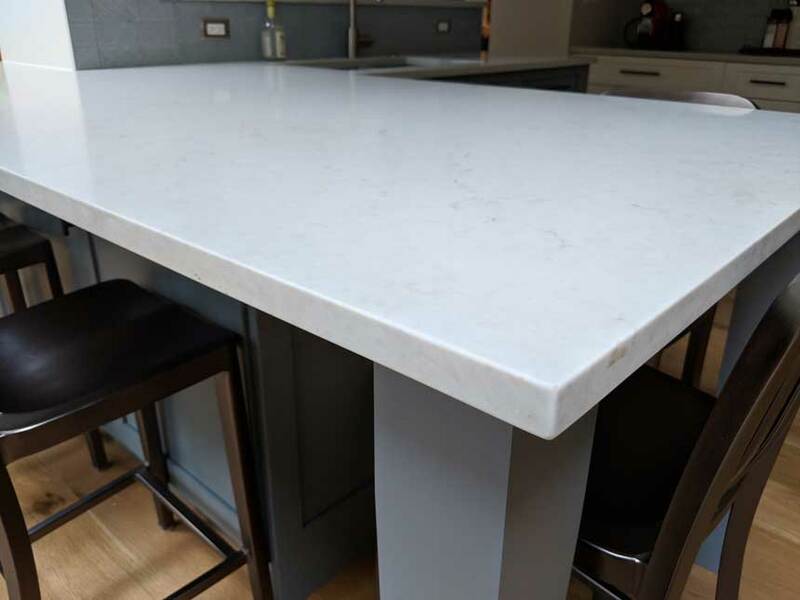 Caearstone quartz countertops were installed for low maintenance every day use and the neutral colour and pattern paired well with the other colours in the kitchen design.